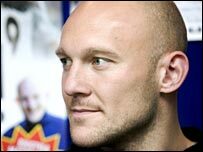 Thomas Gravesen's agent is in the UK for talks about a transfer from Real Madrid for the Denmark midfielder. John Sivabaek told BBC Sport that Celtic and Newcastle are among about four clubs still in the frame to sign 30-year-old Gravesen. Celtic manager Gordon Strachan has previously admitted his interest but is concerned by possible wage demands. "We would have to have a look at it, but there would have to be some homework done on wages," said Strachan. "We would like to try and keep him within the structure that we have got here just now. "But I think it's unfair to speak about anybody who is not here, it is unfair on the team, the player and our fans." Real Madrid have told Gravesen he can leave for any club willing to pay their £2m valuation. The former Everton midfielder has previously said he would prefer a return to the English Premiership. But Sivabaek is not ruling out a move to the Scottish champions.